As always, you can click on images to view larger versions. I’ve already mentioned that my playthrough of The Witcher 2 had been stalled by some hardware issues. Those have been solved, and I’ve actually finished the game now, but simply can’t find the time to finish writing about it. I’ll get to it eventually. 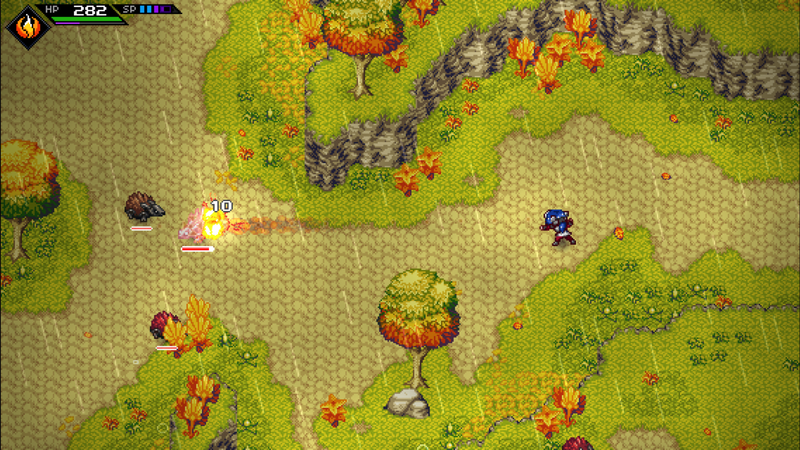 In the meantime, I wanted to share the most excellent demo for CrossCode, an old-school-styled action role-playing game currently seeking funding on IndieGoGo. 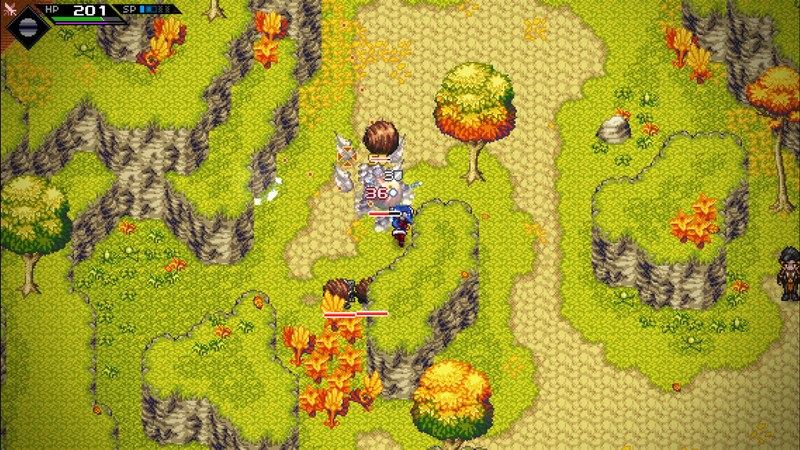 Before going any further, I should state that while the graphical style of the game looks a lot like RPG Maker, CrossCode is definitely not a traditional tile-based Japanese-style role-playing game. It’s a true action role-playing game, playing more like Zelda or Secret of Mana than Final Fantasy. It also looks much cooler in motion than in still screenshots, so you might want to check out some of the cool animated gifs on the IndieGoGo page. 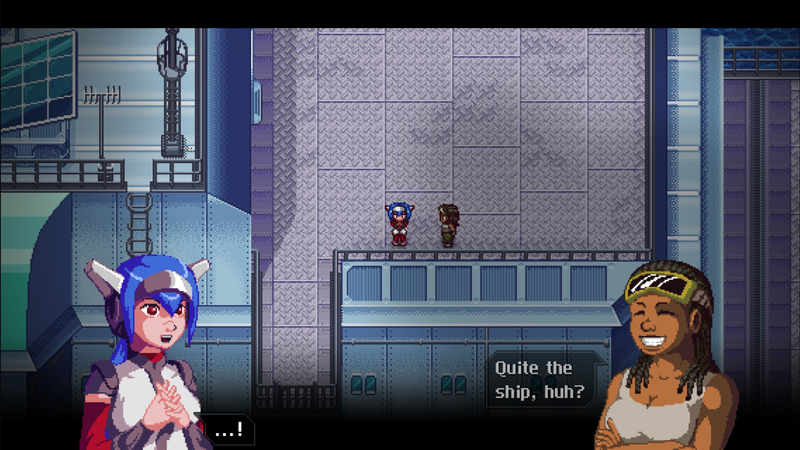 CrossCode came to my attention when I saw a post about the demo over on Rock, Paper, Shotgun, where it was described as “by far, the best demo I’ve played for a currently-crowdfunding project.” Having played it, I agree. The demo is big, polished, and an excellent demonstration of the team’s skill and passion for the project. It has an introduction to the game’s story mode, complete with tutorials, lots of conversations, and a boss battle. Plus, there’s a separate “puzzle” mode, demonstrating the types of puzzles that may appear in the final game, and an “exploration” mode, demonstrating the kinds of environments the player might explore as well as some of the character and gameplay systems that hadn’t yet appeared in the story mode. The premise of the game involves a theme park of the future. CrossWorlds is a massively multiplayer online game, but instead of running on computers, it takes place on an actual planet, with players connecting remotely to humanoid avatars (basically robots) to duke it out with various creatures and each other. The protagonist is one such player, who seems to have lost her memory and her ability to speak. She wakes up on a boat (or rather, her avatar does), hanging out with some of the CrossWorlds staff who work on the planet to help keep the game running. It quickly becomes apparent that something bigger is taking place. The game within a game concept is really smart, because it provides the perfect excuse to include lots of overwhelmingly game-like elements while telling a different kind of story. One of my favorite details is that much of the CrossWorlds game is still virtual, taking advantage of Augmented Reality, which is something of a hot technology at the moment. That seemed like a perfectly believable way to create a huge, crazy game like CrossWorlds without the players wrecking everything. I played the story segment first, and liked the characters and set up of the story. Character art is great, which is critical because the protagonist can’t speak. Instead, she communicates through her facial expressions, each lovingly drawn. Surprise, approval, embarrassment, consternation and even the classic “innocent whistle” all appear and look great, not just for the protagonist but the other characters as well. Animations and environmental art are also high quality, and the entire segment felt like a finished piece of the game. The puzzle section of the demo is also good, but it’s more clearly a demo level. 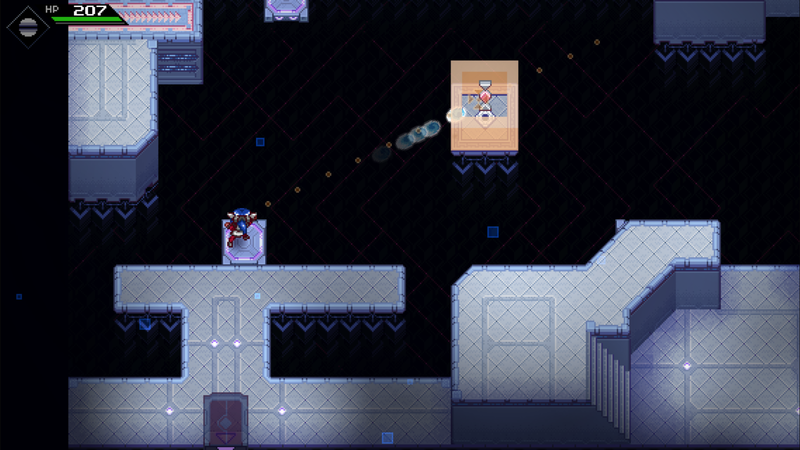 Puzzles center around throwing balls at things (the protagonist is playing the spheromancer class, see) and devising trajectories such that they will bounce ito switches at the right times to open gates or move platforms. It’s pretty standard puzzly stuff but it works well and looks great. I haven’t finished the exploration part of the demo yet but that’s where things are the most experimental. 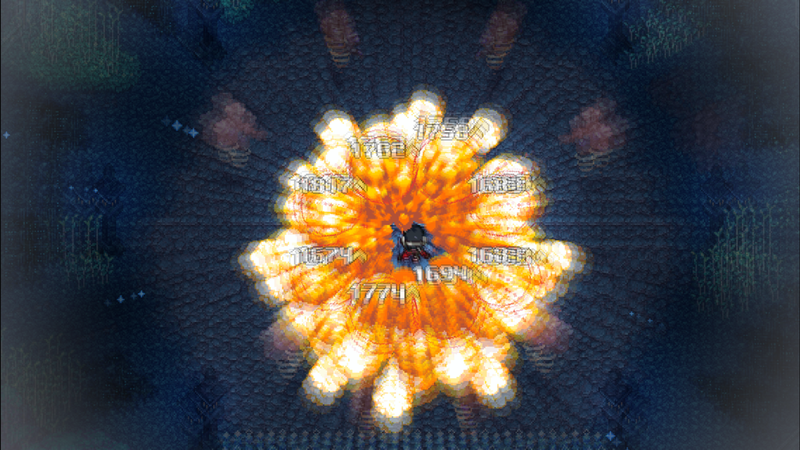 Players are introduced to equippable items, leveling and upgrade systems, and special moves and elemental attacks. It’s a bit much to take in all at once, but I’m sure that in the final game these will be explained via a tutorial like the more basic one that’s already in the story mode here. I also found that I had a surprisingly tough time fighting off the hedgehogs and squirrels populating the map, until I figured out the correct tactics to defeat them. Mashing buttons won’t work in CrossCode; careful use of ranged and melee attacks plus dodges and blocks are key, and different strategies are required for different types of enemies. I enjoyed the combat a lot but did have a little difficulty with the controls. The game supports mouse and keyboard control or gamepad control, but it didn’t recognize my third-party gamepad so I was stuck with mouse and keyboard. Honestly, the mouse and keyboard work great for almost everything. Aiming my thrown balls and dashing around was a breeze. But melee attacks were difficult. To perform these, I had to move the actual mouse crosshair close to my character. If the crosshair was farther away, she would throw a ball instead of performing a melee strike. Since I was mostly using the mouse to choose the direction, rather than distance, to throw, I didn’t pay much attention to the actual position of the crosshair, which made it hard to switch between melee and ranged attacks easily. I would have preferred a dedicated button or key for melee attacks. But I did get used to the system eventually, and it might be an intentional way to increase the difficulty, since melee attacks are strong and strike multiple enemies at once. With the current controls they require more finesse to use; if they had a dedicated button they might be too powerful. But again, I haven’t tested the gamepad controls so those might be easier to deal with anyway. I wish that demos like this were more common in crowdfunding campaigns. I’m far more convinced that I’ll enjoy the final game from having played the demo than I would have been from the pitch video alone. I don’t know any of the team members from other projects but the demo is enough to convince me of their talent, and make me hope their campaign is a success. The only cause for conern that I see is that the crowdfunding goal is low, with the team hoping to augment it with government grants and presales. If they can’t raise enough money, they run the risk of not being able to finish the game even if the crowdfunding campaign is successful. Right now, the game is only 45% funded, but the deadline was recently extended so there’s about a month left on the clock. If the game sounds interesting, I recommend trying out the demo, as it’s impressive and a lot of fun. You can even play it in a browser if you want! Check it out here. This entry was posted in Uncategorized and tagged CrossCode, Crowdfunding, Demo, IndieGoGo, Radical Fish Games. Bookmark the permalink.